4Easysoft Mac MPG Encoder also assists you to customize output file with trim, crop, effect, merge, preview and more functions. For more detailed features, free download this easy-to-use MPG Encoder for Mac and easily convert and edit videos in intuitive quick steps. And with our cool MPG Encoder converter for Mac users, users can add watermarks and subtitles to the videos; also users can select output audio tracks. This cool software also supports batch processing which allows you to output different formats simultaneously. 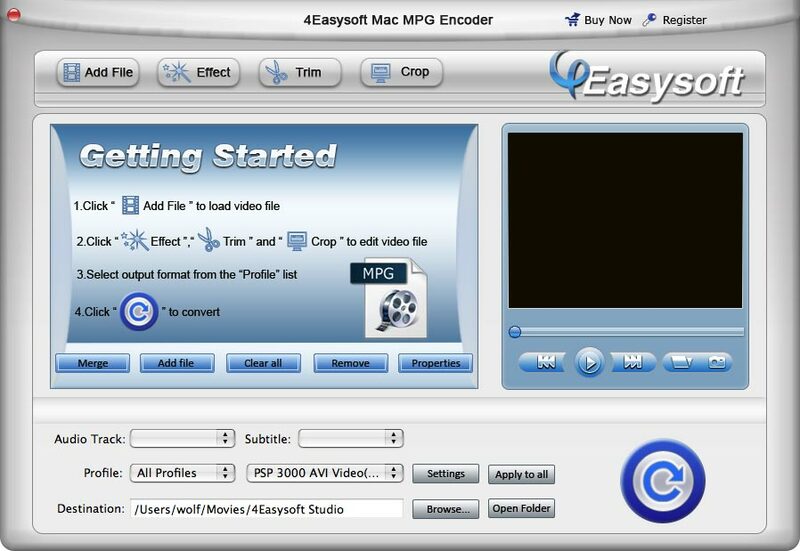 MPG Encoder for Mac can easily encode AVI, FLV, 3GP, MKV, MOD, TS, WMV and other video formats into MPG with ease. You can also convert MPG files to AVI, DivX, XviD, ASF, WMV, even HD H.264, HD AVI, HD TS, HD WMV, HD MOV, HD ASF, etc. You can get AAC, AC3, MP3, MP2, OGG, WAV, WMA from input videos and audios MP3, MP2, AAC, AC3, WAV, WMA, M4A, RM, RAM, OGG, AU, AIF, AIFF, APE, FLAC, NUT directly. The supported devices include iPod, iPhone, Apple TV, PSP, PS3,Wii, Zune, Google Phone, Archos, Creative Zen, iRiver, BlackBerry, Mobile Phone, General Pocket PC. Plentiful optimal profiles are provided for beginners to easily convert AVI to MPG for Mac and FLV to MPEG Mac and finish the conversion without further settings. Pro users can freely edit input videos to customize the output quality.